The Swedish Air Force (Swedish: Svenska Flygvapnet or just Flygvapnet) is the air force branch of the Swedish Armed Forces. The Swedish Air Force was created on July 1, 1926 when the aircraft units of the Army and Navy were merged. Because of the escalating international tension during the 1930s the Air Force was reorganized and expanded from four to seven squadrons. When World War II broke out in 1939 further expansion was initiated and this substantial expansion was not finished until the end of the war. Although Sweden never entered the war, a large air force was considered necessary to ward off the threat of invasion and to resist pressure through military threats from the great powers. By 1945 the Swedish Air Force had over 800 combat-ready aircraft, including 15 fighter divisions. About 250 aircrew were killed in crashes 1939-1945 according to statistics that were not disclosed during the war years but published afterwards. The Swedish Air Force underwent a rapid modernization from 1945. It was no longer politically acceptable to equip it with second-rate models. Instead, the Air Staff purchased the best it could find from abroad, e.g. P-51D Mustangs, De Havilland Mosquito NF.19 night fighters and de Havilland Vampires, and supported the development of top performance domestic models. When the Saab 29 Tunnan fighter was introduced around 1950, Sweden suddenly had planes that were equal to the best of the Royal Air Force, the Soviet Union's VVS, and the U.S. Air Force. In the late 1950s the air force introduced the Bas 60 air base system, which revolved around force dispersal of air squadrons across many wartime air bases in case of war in order to make it complicated for an opponent to destroy the air force on the ground. Road runways were also introduced as backup runways. Bas 60 was developed further into Bas 90 during the 1970s and 1980s. During the Cold War large amounts of money (including funds intended for the Swedish nuclear weapons programme) were spent on the Swedish Air Force and domestic airplane production. In 1957 Sweden had the world's fourth most powerful air force, with about 1000 modern planes in front-line service. During the 1950s, it introduced fighters such as the Saab J 29 Tunnan, Saab A 32 Lansen and Saab J 35 Draken. In June 1952 the Swedish Air Force lost two aircraft on Cold War operations, in what became known as the Catalina affair. A signals intelligence Douglas DC-3 was intercepted by Soviet MiG-15s over the Baltic, and shot down with the loss of three aircrew and five civilian technicians. A PBY Catalina rescue seaplane was then also downed, the five-man crew being rescued from the sea by a freighter. In the Cold War era, more than 600 Swedish fighter pilots were killed in crashes during peacetime exercises and training in the 1945-1991 period. In the 1950s-60s era the flight training curriculum was deficient and the training regimes were too risky and some aircraft types had design flaws. In the 1950s, about 21 pilots were killed annually. In the 1960s the average number of killed were 13 per year, which meant Sweden had sixfold mortality rate per 100,000 flight hours compared to the United States. In the 1960s flight safety starts to become a consideration, not due to the death toll but because the aircraft were getting increasingly expensive. In October 1960, a Lansen fighter crashed into a farmhouse and killed 7 people. In the 1970s the death toll 6-7 per year. The Swedish Air Force has seen involvement at some level in three wars, the Finno-Soviet Winter War in 1939–40, in which volunteers took part, the Congo Crisis, 1961–64, and in the 2011 Libyan civil war. When the Soviet Union attacked Finland in November 1939, Sweden came to its neighbour's assistance in most ways short of joining the war outright. A Swedish volunteer infantry brigade and a volunteer air squadron fought in northern Finland in January till March 1940. The squadron was designated F 19 and consisted of 12 Gloster Gladiator fighters and four Hawker Hart dive-bombers. The Swedish Air Force saw combat as part of the United Nations peace-keeping mission ONUC during the Congo Crisis in 1961 to 1964. It established a separate air wing, F 22, equipped with a dozen semi-obsolete Saab 29 Tunnans, which performed well under the rugged conditions in central Africa. The secessionist adversaries possessed only a small number of aircraft with poor combat capabilities, e.g. Fouga Magister trainers. With the end of the Cold War the Swedish Armed Forces underwent a massive restructuring process. During this time, several air bases were deemed unnecessary and closed with fighters like the Saab 37 Viggen retired prematurely. In 1994 the air force had over 400 fighters, by 2005 the number had sunk to fewer than 150. On March 29, 2011, the Swedish prime minister announced that eight Saab JAS 39 Gripens would support the UN-mandated no-fly zone over Libya. The announcement responded to a NATO request for assistance. The Swedish fighters were limited to supporting the no-fly zone and were not authorized to engage in ground attack sorties. The deployment was approved by the Swedish Riksdag on April 1, 2011 and the first jets departed for Libya on April 2. A C-130 Hercules accompanied the fighters for mid-air refueling. Located at Såtenäs outside Lidköping, operates JAS 39C/D. Located at Kallinge in Ronneby, operates JAS 39C/D. Located at Kallax in Luleå, operates JAS 39C/D. Kallax in Luleå (co-located with F 21), operates Hkp 14. Malmen in Linköping, operates Hkp 15 and Hkp 16. Kallinge in Ronneby (co-located with F 17), operates Hkp 14 and Hkp 15. The air transport units perform airlift operations, and are used in both national and in international missions. The unit also organizes the Swedish part of the Heavy Airlift Wing in Hungary. Signals reconnaissance units conduct electronic combat reconnaissance and intelligence gathering. The Air Force has deployed the Gripen in service. Designated Saab JAS 39 Gripen— JAS standing for Jakt (Air-to-air), Attack (Air-to-surface) and Spaning (Reconnaissance), and means every Gripen can fulfill all three mission types—, it is a modern multi-role fighter designed to replace the Draken and Viggen. Capabilities of Gripen include a short runway requirement, advanced data link equipment, and canard delta design with lateral instability and fly-by-wire. Sweden originally ordered 204 Gripen aircraft. Out of these 80 remain in service in the Air Force today and an additional 28 are leased to the Czech and Hungarian Air Force (14 each), with an option to acquire them when the lease period expires. Furthermore, 12 aircraft were sold to the Royal Thai Air Force. The Swedish Air Force is being adapted to new future tasks. With the collapse of the only military threat, the Soviet Union, and the end of the Cold War, the Swedish government has cut the Swedish armed forces budget, including the Air Force and its fighters. Today about 80 Gripen C/D fighters remains in service. Some orders have been made on the helicopter side and about 40 new units will join the air force in the coming years. Saab has also joined the primarily French project for the unmanned future stealth plane Dassault nEUROn. In 2008 and 2010, the Swedish armed forces wanted to retire even more fighters and close air bases to relocate money to other branches. However, because of negative response from the public and pressure from the Swedish government, no cuts happened As of 2011[update]. Defense Minister Sten Tolgfors responded to the Russian purchase of Mistral-class amphibious assault ships by saying that the Swedish Air Force would need "sea targeting capabilities". In 2013, the USMC introduced Swedish helicopter units to the forward air control airborne mission profile for better air-ground coordination. In the same year, 60 further modified E class Gripens were ordered with the first plane to join the Air force in 2018. In April 2014, the Swedish government proposed another 10 fighters making the total order 70 planes. Today the Swedish Air Force main fighter is the Saab JAS 39 Gripen, in the C/D versions. By 2018 95 fighters were active with about 30 of these being updated from the A version. The heavily modernised E version will replace the current fleet of Gripen Cs. The new aircraft includes a new Active Electronically Scanned Array (AESA) radar, and is powered by the General Electric F414G. It carries more fuel and weapons. The upgrade also includes new weapon systems like the Meteor missile system. In 2013, Saab signed an agreement with the Swedish Defence Materiel Administration for 60 new Gripen in the E version. The first aircraft is to join the Swedish Air Force by 2018. There are also plans to buy further 10 aircraft. The Swedish C-130 Hercules (TP-84) were bought from the United States in the 1960s and has been updated several times. By 2020 the current version will not be able to fly because of new restrictions to civilian air space. The Swedish Defence Materiel Administration has been tasked to update the aircraft so they can remain in service to 2030. There are also plans to buy new aircraft by 2024 to replace the current fleet. As part of the Heavy Airlift Wing cooperation, Sweden also operate three Boeing C-17 which are located at Pápa Air Base in Hungary. Sweden uses the Saab 105 as the primary jet-trainer. About 40 planes are today operational. Designed in the 1960s the aircraft is starting to show its age and talks about replacing these aircraft has begun. One plan is to replace the Saab 105 system with the future Boeing T-X program, a joint trainer program developed by Boeing and Saab. Other option are the Brazil Embraer Super Tucano and the Swiss PC-21. ^ Gyllenhaal, Lars. "I luftstrid över Lappland". Svenskt Militärhistoriskt Bibliotek (in Swedish). Archived from the original on 14 July 2013. Retrieved 11 December 2012. ^ Prien, Charles (1976). "Survey of Oil-Shale Research in the Last Three Decades". In Yen, T.F. ; Chilingarian, George V. Oil Shale. Amsterdam: Elsevier. p. 236. ISBN 0444414088. ^ a b "Svenska flygvapnets dödliga facit". Militarhistoria.se (in Swedish). 17 February 2018. Archived from the original on 15 December 2018. Retrieved 15 December 2018. ^ Rystedt, Jörgen (1 October 2005). "Flygbassystem 60" (PDF). Försvarets Historiska Telesamlingar (in Swedish). Archived (PDF) from the original on 4 March 2016. ^ Rystedt, Jörgen (25 April 2009). "Flygbassystem 90" (PDF). Försvarets Historiska Telesamlingar (in Swedish). Archived (PDF) from the original on 31 October 2017. ^ Törnell, Bernt (5 February 2007). "Svenska militära flygbaser" (PDF). Försvarsmakten (in Swedish). Archived (PDF) from the original on 3 June 2017. ^ Andersson, Lennart (23 November 2006). "Svenska reservvägbaser" (PDF). Försvarsmakten (in Swedish). Archived (PDF) from the original on 4 June 2017. ^ "The Growth of the Air Force". Flygvapenmuseum. 1 May 2010. Archived from the original on 14 March 2012. Retrieved 29 March 2011. ^ "Flygvapnet 80 år". Statens försvarshistoriska museer (in Swedish). Archived from the original on 18 March 2012. ^ "Pilotdöden – vårt okända nationella trauma". Vetenskapsradion Historia (in Swedish). 14 March 2013. Sveriges Radio. Archived from the original on 15 December 2018. Retrieved 15 December 2018. ^ a b c "Nu utreds massdöden inom flygvapnet". Expressen (in Swedish). 29 April 2013. Archived from the original on 15 December 2018. Retrieved 15 December 2018. ^ "Sweden plans to join Libya no-fly zone with fighter jets, but no ground attacks". Google News. Associated Press. 29 March 2011. Archived from the original on 2 April 2011. Retrieved 30 March 2011. ^ "Swedish Gripen Planes Headed to Libya". The Local. 2 April 2011. Archived from the original on 4 April 2011. Retrieved 2 April 2011. ^ a b c d e f g h i j k Hoyle, Craig (1 December 2017). "Analysis: World Air Forces maintaining strength". Flightglobal. Archived from the original on 2 December 2017. Retrieved 12 December 2017. ^ "Helikopter 15". Försvarets materielverk (in Swedish). Archived from the original on 28 July 2013. Retrieved 18 February 2018. ^ "Materiel och teknik Flyg: SUAV systemet Falken" [Goods and technology Flights]. Försvarets materielverk (in Swedish). Archived from the original on 5 July 2011. ^ "Materiel och teknik: UAV 3 Ornen". Försvarets materielverk (in Swedish). Archived from the original on 12 December 2011. ^ "Förband och förmågor: Julgran markerar slutet för en epok". Försvarsmakten (in Swedish). Archived from the original on 18 April 2013. ^ "World Air Forces 2013" (PDF). Flightglobal. Archived from the original on 13 January 2013. Retrieved 20 May 2015. ^ "Gripen Operational in the Royal Thai Air Force". Saab Group. 8 July 2011. Archived from the original on 14 September 2011. Retrieved 28 August 2012. ^ "Kraftig minskning av antalet Jas-plan". Sveriges Television (in Swedish). 11 May 2008. Archived from the original on 23 March 2009. ^ "Ingen flygflottilj utpekad". Sveriges Television (in Swedish). 15 May 2008. Archived from the original on 23 March 2009. ^ "Inga nedläggningar av förband". Dagens Nyheter (in Swedish). 13 September 2008. Archived from the original on 6 February 2009. Retrieved 20 May 2015. ^ "Försvaret föreslår nya nedläggningar" [The defense proposes new closures]. Smålandsposten (in Swedish). 6 March 2010. Archived from the original on 2 April 2011. Retrieved 29 March 2011. ^ Benitez, Jorge (19 April 2011). "Sweden may change its defense forces to counter Russia's Mistral purchase". Atlantic Council. Archived from the original on 14 March 2013. ^ Vayavananda, Tatum (28 August 2013). "MAWTS-1 Marines introduce FAC(A) to Swedish Air Force". Marine Corps Forces Europe. Archived from the original on 30 August 2013. ^ "Klartecken ätt köpa nya JAS plan" [The go-ahead to buy new fighter, attack & reconnaissance planes]. Riksdag & Departement (in Swedish). 17 January 2013. Archived from the original on 3 May 2014. Retrieved 8 October 2014. ^ a b "Så vill regeringen stärka försvaret" [So the government wants to strengthen the defense]. Dagens Nyheter (in Swedish). 22 April 2014. Archived from the original on 8 September 2014. Retrieved 8 October 2014. ^ Gummesson, Jonas (29 April 2015). "Vart tredje JAS-plan taget ur drift" [Every three JAS aircraft in service]. Svenska Dagbladet (in Swedish). Archived from the original on 17 August 2016. Retrieved 5 August 2016. ^ "Gripen E Multirole Fighter Aircraft". Air Force Technology. Archived from the original on 26 July 2016. Retrieved 5 August 2016. ^ "Saab signs agreement for the next generation fighter aircraft Gripen E and receives development order". Saab Group. 15 February 2013. Archived from the original on 21 August 2016. Retrieved 5 August 2016. ^ Augustsson, Tomas (20 July 2016). 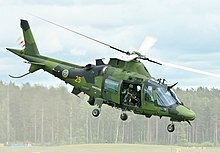 "Flyg jättarna som kan lyfta svenska Försvaret" [Flights giants that can lift Swedish defense]. Svenska Dagbladet (in Swedish). Archived from the original on 3 August 2016. Retrieved 6 August 2016. ^ Augustsson, Tomas (25 May 2015). "Saabs nya skolplan för avancerat för Sverige". Svenska Dagbladet (in Swedish). Archived from the original on 19 February 2017. Retrieved 22 May 2017. ^ "Operativ effekt är inte detsamma som den billigaste lösningen". Wiseman's Wisdoms (in Swedish). 24 May 2015. Archived from the original on 2 February 2017. Retrieved 22 May 2017. Annerfalk, Anders. Flygvapnet: An Illustrated History of the Swedish Air Force (Ljungsbro: Aviatic Förlag, 1999). Åselius, Gunnar. "Swedish strategic culture after 1945." Cooperation and Conflict 40.1 (2005): 25-44. Böhme, Klaus-Richard. The Growth of the Swedish Aircraft Industry: 1918-1945: the Swedish Air Force and Aircraft Industry (Sunflower University Press, 1988). Weibull, Alise. "The Swedish Armed Forces: Recent Developments and Future Strategy." in Giuseppe Caforio, ed., Cultural Differences between the Military and Parent Society in Democratic Countries (Emerald Group Publishing Limited, 2007) pp. 307-312. Wikimedia Commons has media related to Swedish Air Force. 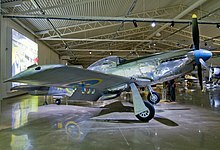 Wikimedia Commons has media related to Swedish Air Force Historical Flight, SwAFHF.